Sciatica refers to pain caused by the sciatic nerve that carries messages from the brain down the spinal cord to the legs. The pain of sciatica typically radiates down one side from the lower back into the leg, often below the knee. The most common cause is a bulging (“herniated”) disc in the lower back. Discs are tire-like structures that sit between the bones of the spine. The disc herniation occurs when the gelatinous nucleus protrudes out of the outer ring into the spinal canal, compressing and / or inflaming the nearby nerves. Sciatica is most common in people 30 to 50. 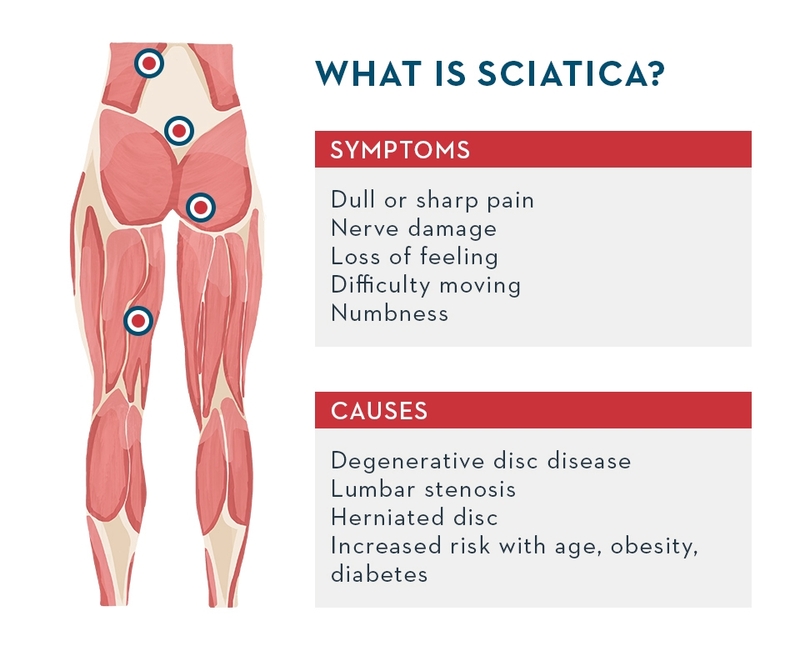 What are the symptoms sciatica? The symptoms of sciatica are often worse with sitting or coughing, and may be accompanied by numbness or tingling in the leg. A physical exam can confirm that the sciatic nerve is involved, and weakness or diminished reflexes in the legs should be verified. While the vast majority of causes of sciatica are not serious, anyone experiencing sciatic nerve pain should see a doctor for a correct diagnosis and the right set of treatment options. The key to diagnosing sciatica is a thorough history and a focused exam. Imaging tests should only be ordered in case of severe pain. Treatment focuses on pain management and keeping people as active as possible. In general, symptoms improve over a few weeks, with no need of surgery and injections. Surgery involves removing the disc material that is affecting the nerve, but 5% to 10% of people who have surgery will not be helped by it, or may have worse pain afterwards. Since sitting increases pressure on the discs in the lower back, prolonged sitting or driving should be avoided. A physical therapist can develop an individual stretching and exercise routine, and also help improve posture to take pressure off the sciatic nerve. Yoga is on type of exercise that has been shown to be safe and beneficial for both the treatment and prevention of sciatica. Specifically yoga poses for your lower back, hamstrings, and those that externally rotate the hip, can help to relieve nerve pain. Learn more about the benefits of Yoga and how to begin, here. Posted in Medical and tagged Sciatica, Pain, Back pain, Leg pain, Medical .